Please find this as an instructional guide to the Land of Orinda. Lia: Lia is the leader of a small band of men who go on terrific adventures or as might be interpreted, “quests”. She is called Lieh-heyr by the gorlags. Siegfried: Siegfried is Lia’s counterpart, and her “second-in-command”. He is always thinking through his stomach. He is a very slap-stick character. Rowan: Rowan is the brother of the Princess Daschl and son of the King of Feyris. He used to be an ambassador to Kyrie and when he was growing up he wandered into the Swamp of Sandring. Skinner: Skinner is a gorlag. He is stationed as a guard outside the keep. Nessa: The head dresser in Moir Awin. She makes headwear such as tiaras, circlets, and veils. Nessa means “promontory (precipice)” and “pure”. Daschl: Princess Daschl is the sister to Rowan and is the one who is cursed with a mysterious illness that no one knows the cure for. Daylat: Queen Daylat of Feyris disappeared after trying to find the cure for her daughter. Phelan (FAY-LEN): He is a burly man, one in Rowan’s father’s army. Pelageya (PAH-LAY-GEE-UH): She’s a mage from Fanarion whose gift is to hear the minds of others. She is also a little short-witted and oftentimes accidentally spills the beans. Doron: Doron is a future-seeing mage from Fanarion. He uses meditation to guide his mind forward in reality. Mira: Mira is the Guardian of Harper Wood. She is a greenwoman and a healer. Driyed (DRY-ED)/Dentrelaos (DENT-REE-LAY-OZ)/Dentrelo (DENT-REE-LOW): Dryads (Tree spirits). Driyed is the old Orindan term, Dentrelaos is the term in Fanarion, and Dentrelo is the singular Fanarion form. Gorlag (GORE-LAG): Something like a goblin. They live in Cragash and are muscular creatures obtaining a sort of human form. I related the word as derived from Russian “gulag” which is denotive of the Soviet repressive slave labor system and all aspects of which. Oycos (OI-KOS): It is the forest that separated Feyris from Fanarion. Oycos is Greek (“oicos”) for “living place”, and it is from oicos that eco is formed. 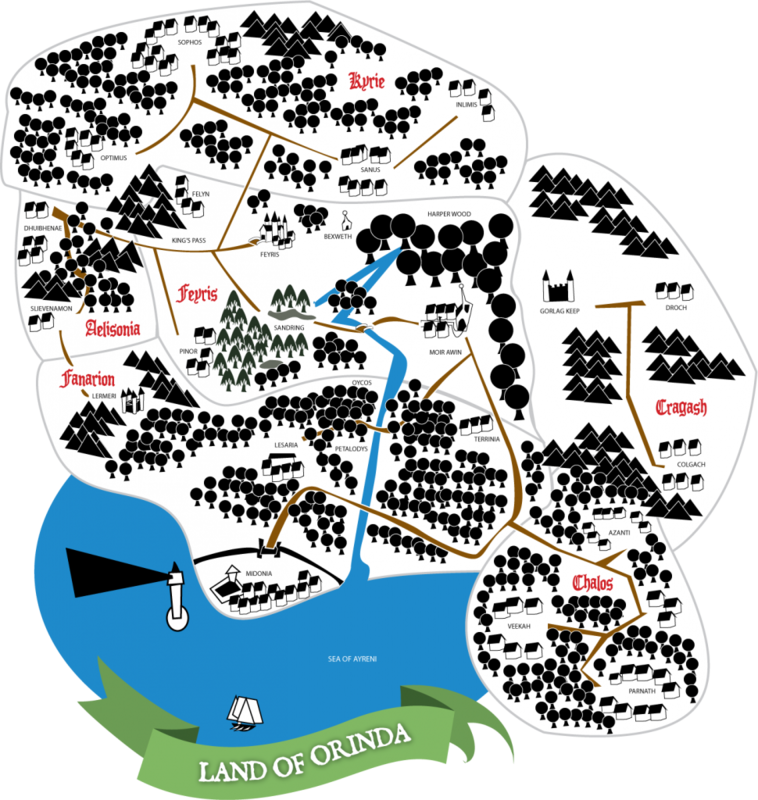 Feyris: The central kingdom in Orinda ruled by King Birchell and Queen Daylat. The capital city is also called Feyris. Other cities in Feyris are Felyn, Pinor, and Moir Awin. There is an abbey called Bexweth which is also present in the kingdom as well as Harper Wood and the Swamp of Sandring. The King’s Pass is a highway leading from Feyris into Aelisonia to the west. Fanarion: One of the southern kingdoms in Orinda. It is ruled by King Stefan and Queen Herah in Midonia, which borders the Sea of Ayreni. The following cities are also under Fanarion’s rule: Lermeri, Lesaria, and Terrinia. The forest of Oycos lays to the north, bordering Feyris. It is also home to the Pyxie Moths in Petalodys. Chalos: A matriarchal kingdom in the southernmost part of Orinda. Azanti, Veekah, and Parnath at the three cities therein. The only accessible route is through Fanarion. Cragash: This is where the gorlags live. They have a keep to the northwest and two cities on the east called Droch and Colgach. They keep human servants (or slaves more like) which they refer to as sgalags. Kyrie: Kyrie is a fair land to the north and is now one of the most advanced locations in Orinda. They gave up their kingdom to have a state system which is ruled by the people dwelling within at the very beginning of the separation. Aelisonia: Aelisonia, which in the early ages was the Land of Kings when Orinda was united, was where kings were born and raised. The current ruler of Aelisonia is called Cadfael. His family had for generations come from Aelisonia’s mountain city of Slievenamon. Dhuibhenae is the other city, albeit small, in the northern part. Sea of Ayreni: “Sea of Peace”. It is the ocean that borders Fanarion.